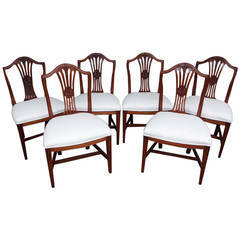 Set of four Biedermeier cherrywood side chairs, each with a tablet crest with Bookmatched veneers and ebonized molding over a Gothic splat; the upholstered seats on square tapering legs. 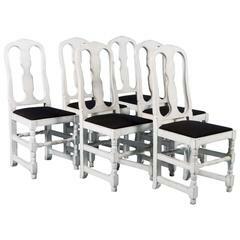 Ideal for a breakfast room or card table. 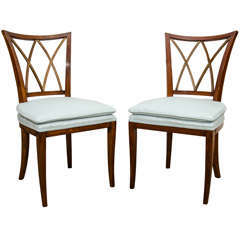 An elegant set of four fruitwood and parcel-gilt 19th century Continental side chairs. Seats have been re-upholstered in a glamorous metallic pale blue linen. 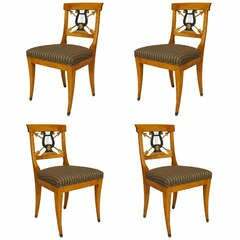 Set of four maple side chairs with striped upholstery and backs bearing a carved green painted and gilt trimmed lyre and crossed arrow design. 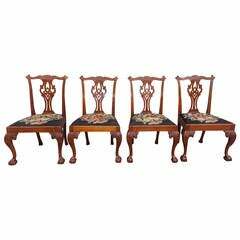 Set of four Biedermeier style side chairs.